Yet this is something that has escaped the attention of our political elites. And, as it turns out, our financial and cultural elites—as the recent college admissions scandal indicates. Many Democrats want to double-down, promising “free college” to young people—a euphemism for college funded by taxpayers. 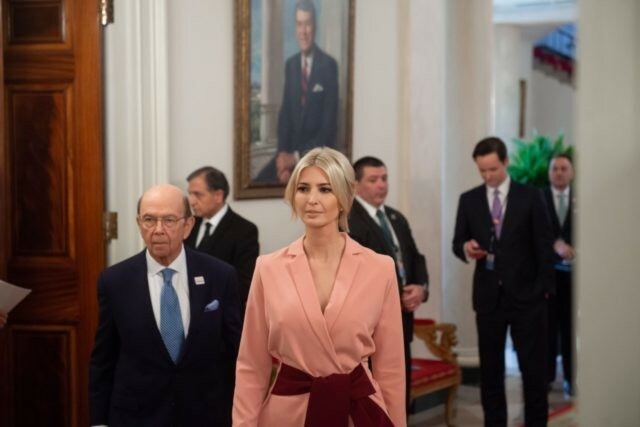 “I think culturally, for a long time we have created and perpetuated the narrative that there is one pathway to achieving the American dream and its four-year university,” Ms. Trump said in a recent interview. That has been instilled into American students, it’s often American parents that feel that is the only viable path. So you have kids going into school racking up enormous amounts of student debt that they’ll often take decades if there ever able to pay it off without a skill, if they ultimately graduate. So I think opening up the prism and saying there are many different pathways. It depends what you want in your life and taking the stigma away from those who choose alternative pathways who choose technical schools, vocational education. At the end of the day, it’s about connecting workers with their passion, with their jobs. There’s very little opportunity for somebody who wants to the vocational route, the technical route because all the money pushes you into a four-year college system. Just as her father drew attention to the incredibly bad hand American industrial workers had been dealt by decades of anti-American trade deals, Ms. Trump is drawing attention to the bad hand the U.S. has dealt our young people. The facts are stark. Over the past 40 years, the U.S. has doubled the share of high school graduates who go on to get college degrees. Forty-six percent of high school graduates receive degrees from four-year colleges, and another 24 percent get degrees from two-year colleges. This increase in college education, however, has come at a steep cost. The relative benefits of a college degree have been declining for nearly two decades, while costs have been escalating. College graduates still earn more than high school graduates and are less likely to be unemployed—but the gap has been contracting. And the income and employment benefits may overstate the lifetime effects of college degrees. The college wealth premium—the amount of extra wealth college graduates have accumulate the course of their lifetime—has declined even more rapidly than the income and employment premium, according to a recent study by the Federal Reserve. And among blacks, Hispanics, Asians—that is, everyone except whites—there is no wealth premium at all, the study found. After ten years, nearly one-third of college graduates wind up in a job that does not require a college degree, the Wall Street Journal reports. The average sticker-price of a four-year college, including room and board, is now $50,000 per year. As Barron’s Jack Hough recently pointed out, $200,000 in cash invested in the name of a 22 year old would produce a $3 million retirement nest egg by the age of 68, if the money is invested at about a 6% year return. This high price is being financed by debt. On average, a college graduate owes twice as much debt as she did twenty years ago, according to the Wall Street Journal. Educational loans now amount to more than $1.5 trillion. More than one out of ten student loan borrowers will default on their loans. Federal Reserve economists recently studied the impact all that debt is having on those aged 24 to 32. They found that while it plays a significant role in keeping young people from buying homes, although other factors—including the high price of homes—were more important. This is having a profound effect on American society. People are getting married later, which reduces the number of children they have. Women, in particular, delay marriage when they bear lots of student debt. And a significant number of people who say they do not want children cited student debt as the reason. Twenty-two percent of college graduates were delayed by at least two years in moving out of a family member’s home due to their student loans, a survey of millennials by the National Association of Realtors found. More than half of respondents said they were delayed in continuing their education or starting a family due to student loan debt. Bernie Sanders and others who have endorsed the idea of relieving students of the burden of paying for college address the debt side of the problem only. And it’s not clear that this is really much progress at all since professors will still have to be paid, buildings maintained, textbooks purchased. So while a student might not have to foot the bill, that debt will need to be borne by workers—which is really just a transformation of individual debt into higher taxes. And if history is any experience, the government will not effectively be able to contain the burgeoning costs. If anything, quite the opposite: cost increases will accelerate once individuals no longer see the bills. There’s no such thing as a free lunch, even if in a college cafeteria. The first step to recovery is admitting you have a problem. We have a problem, as Ms. Trump has indicated. Others in Washington, DC, should take note.